Hanging Bat with Closed Wings Garden Sculpture... one of the most notable things about the bat is that it can fly! The bat has wings that are composed of a double membrane stretched over a framework of fingers bones. Flight is a fascinating thing, & if you have ever watched a bat, they do it well. The bat can control how much lift & how much thrust it gains from each wing beat. The Dupere Closed Wing Bat Garden Sculpture is also available in a large size Use the drop-down for ordering by size. 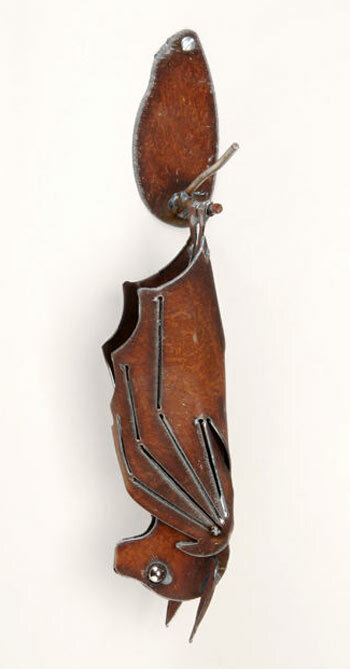 Henry Dupere Closed Wings Hanging Bat Rusted Metal Garden Sculpture. Size: Small Closed Wings Hanging Bat Garden Sculpture, Overall length 15". Size: Large Closed Wings Hanging Bat Garden Sculpture, overall length 18.5". Hanging Bat with branch extends 7-1/2" from wall. Shiny stainless steel ball bearing eyes. Three-dimensional rusted metal bat garden sculpture.